As our years in this world progress, we experience a plethora of unforgettable events. But as we grow old, our capacity to do certain tasks changes. There are activities that prove to be difficult to handle. It may range from doing the daily chores to simple tasks like getting out of bed. During this stage in a person’s life, he needs an abundance of care directed his way. Some families opt to send the elderly to a care home or a nursing facility where people can take good care of them. That is understandable considering the fast-paced life that they are leading. But somehow, it is a saddening affair to take a person out from the place where he has lived most of his life. The home is where we were born, started our families and nurtured our children. Even if it is just a physical edifice, it still houses the splendid memories that have happened in a person’s lifetime. At Advent One Home Care Agency, we care because we want you or your loved one to stay at home for as long as possible. And if they do need to live elsewhere, we want to ensure that that environment will be similar to the warmth and welcome that only a home can give. Advent One Home Care Agency wants you to be where you are most comfortable. 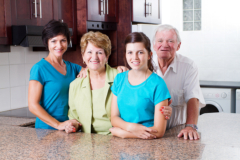 We aim to give you the care services that you need without having to take you out from your homes. With our services and our personnel, your loved ones will experience care like never before. Call 214-503-6854.